Who's winning the battle for your buck in the glasses market? Want to know which optometrists Kiwis are most satisfied with? See the results of our 2017 retailer satisfaction survey. Allegations of misleading conduct, half-truths and innuendo – welcome to the world of retail optometry. Major chains OPSM and Specsavers were embroiled in court action over Specsavers' ads which OPSM claimed were misleading. The matter has finally been settled out of court. The OPSM and Specsavers case stemmed from ads run by Specsavers in 2010 that compared its prices with those mystery shoppers had found at OPSM. Luxottica, OPSM's Italian-based owner, argued that the prices quoted for its specs were inaccurate and that the ads were likely to mislead consumers. Allegations of misleading conduct, half-truths and innuendo – welcome to the world of retail optometry. Luxottica's claim was dismissed by the High Court. But the Court of Appeal found the case should have gone to trial as it was "clearly arguable" the ads didn't represent OPSM's cheapest deals. Even if the figures were correct, the court considered the ads may still have been misleading because of the way the information was presented. In a joint statement, the companies told us a confidential settlement has since been reached and that they're satisfied with the outcome. Neither is commenting further on the matter. Specsavers may have taken a hit in this case but it's rapidly gaining ground in the glasses market. Since setting up shop here in 2008, the optometry giant has opened 52 stores and now boasts 30 percent of the market. Sales were worth $65.8 million in 2011. The company's success has been aided by a high-profile marketing campaign, luring shoppers with discounted eye exams and 2-for-the-price-of-one deals on new glasses. Its advertising budget has gone from $3.9 million in 2010 to $7.1 million in 2011. Rival Luxottica – which includes OPSM, Budget Eyewear and Sunglass Hut in its stable – operates 82 stores. According to its latest available annual accounts, Luxottica spent over $4 million on marketing here in the year to December 2010. It told us sales were worth $61 million in 2011. While the big brands command centre stage, smaller players are fighting back. Eye Pro – a group of affiliated stores – ran an ad in 2011 stating, "when you see an optometrist you need to be certain ... that they're independently New Zealand owned and operated, not just making up the numbers for some multi-national chain peddling their own restricted range of cheap frames". But Specsavers jumped on the ad, complaining to the Advertising Standards Authority. The company said it took strong objection to the wording which it claimed "by implication is seeking to denigrate Specsavers". The dispute was settled when Eye Pro amended the ad to remove the offending content. Specsavers itself has received 2 warnings from the Commerce Commission for alleged misleading representations. Both warnings were issued in 2011 and related to product promotions that the commission considered may have been in breach of the Fair Trading Act. While the ad wars look set to continue, are they leaving consumers any better off? Price has always been the biggest gripe for consumers. For a product with a few basic components, the cost of glasses can seem staggering. But you're not just paying for the materials. Other retail costs are built into the price. With "designer" brands, you're also paying for the logo. Price is Specsavers main drawcard. Its headline offer of glasses "from $69" is designed to attract shoppers looking for a cheaper deal. However, choices in this range are limited: just 26 of the 1000+ glasses it advertises retail for $69. Most of its specs range from $299 to $499. These prices are for frames with single-vision lenses. If you need bifocals or progressive lenses, you'll pay at least another $200, although the store's 2-for-1 offers mean this may still seem like an attractive deal. The lowest price we found advertised at OPSM was $119 for a pair of glasses with single-vision lenses. Visique (a locally owned co-operative) had a similar deal for $199 available at some stores. It told us lower-priced packages may be offered at individual stores or during promotional periods. Prices for designer glasses – which get pride of place in many stores – are typically a lot higher. It's not uncommon to be quoted $500 for a fairly simple frame and lenses. Add-ons (such as anti-reflective or UV lens coatings) can quickly push up the price. We haven't assessed the quality of glasses available from different outlets. But paying more won't necessarily mean you get a better class of glasses. The manufacturing of frames and lenses is dominated by a few major international companies. Some of the companies that make designer brands also make non-designer specs to the same standards. OPSM 49 $70A $119 Owned by the Luxottica Group, a major Italian-based eyewear manufacturer and retailer that also owns Budget Eyewear (which is being phased out) and Sunglass Hut. House brands include Ray-Ban and Oakley. Also manufactures designer brands such as Prada, Ralph Lauren and Versace under license. Specsavers 52 $60B $69 Based in the Channel Islands and operates in the UK, Australia and several European countries. New Zealand stores operate as franchises. Visique 67 variesC $199 A co-operative of locally-owned optometrists. Frames sourced from several suppliers. Lenses sourced mainly from Essilor (one of the world's largest lens-manufacturers). Prices are as at September 2012. A = $90 for exam including digital retinal scan. B = free exam available for AA members. C = each outlet sets its own prices. Glasses (lowest price) is the lowest advertised price for frame plus single-vision lenses. 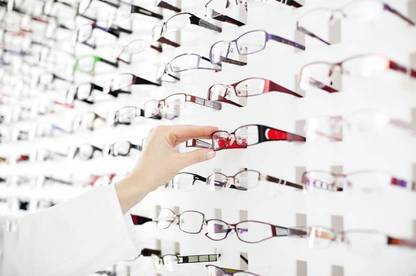 Specsavers may have the edge on price, at least among its main bricks-and-mortar competitors. But many online retailers argue they can offer better deals because they don't have the same overheads as retail stores. It's possible to find specs online for a fraction of the price usually found in traditional outlets. However, buying online isn't without risks. A recent investigation by UK consumer organisation Which? found 15 out of 36 glasses bought online weren't up to par. 10 had lenses that didn't meet required standards and 3 had dodgy frames. A further 10 were given a borderline pass. The most serious problems were with multifocals. Which? experts found several companies sold these glasses without asking for vital information such as the wearer's vertical pupil position and pupillary distance (the distance between the centre of the pupils). This meant the glasses could be unsafe when driving or using stairs, Which? said. Its experts suggested buying online might be fine for anyone with a simple prescription but had doubts about people with complex prescriptions going down this route. They also cautioned against buying from websites that don't ask for critical measurements – such as your pupillary distance. Our table provides basic information about common lens types and coatings. Standard plastic lenses (CR39) Cheapest lenses, usually used in advertised offers. Made from lightweight plastic.Suitable for single-vision, low- or medium-strength prescriptions. Polycarbonate lenses Impact-resistant lenses.Usually more expensive than standard plastic. Recommended for kids and people who play sport. High-index lenses Made from thinner, lightweight material.More expensive than other lenses.Suitable for strong prescriptions. Bifocal lenses Combines lenses for two different distances (such as close-up and long-distance). Multifocal (progressive) lenses Combines lenses for several different distances. The most expensive are called "tailor-made", "free-form", "high-definition" or "latest technology". Anti-scratch Standard on many lenses.Reduces scratching but no lenses are entirely scratch-proof. Anti-reflection Reduces reflection.Can be useful for night driving (reduces street- and car-light reflections). UV protection Shields eyes from ultraviolet rays.High-index, progressive and polycarbonate lenses are already UV-resistant. An ageing population means the need for prescription glasses is set to rise. Eyesight usually begins to change around the age of 40. The New Zealand Association of Optometrists (NZAO) says most people will require glasses for reading to correct presbyopia (sometimes referred to as age-related long-sightedness). Rates of myopia (short-sightedness) are also increasing – a phenomenon that some studies have linked to environmental and lifestyle changes, including more time spent in front of computers. The NZAO says recent epidemiological studies show a strong association between prolonged close work and myopia. While advertising has focused heavily on price promotions, the NZAO is keen to stress that optometry involves more than selling glasses. Regardless of where you buy your specs, it recommends healthy adults should get an eye exam every 2 to 5 years. Director Dr Lesley Frederikson says a comprehensive eye exam will take around 30 to 45 minutes and cover 9 specific checks, including questions about your medical history and assessment of the health of your eye to detect any sign of diseases such as glaucoma. Ask your optometrist whether they're carrying out the checks recommended. A good optometrist will take time to explain what they're doing, what they find and what should happen next. Prices for eye exams vary. The cheapest price we found was $60 and the most expensive was $99. Prescription glasses aren't cheap. Specsavers' rapid growth indicates consumers are looking around for deals. But it’s questionable whether the aggressive marketing tactics seen in this industry are benefiting consumers. If price is important to you, make this clear to your optometrist. Ask to be shown non-designer options. It may be worth visiting several optometrists to compare the styles they sell. Before shopping for glasses, make sure your prescription is up to date. Regular eye exams are essential to pinpoint problems and pick up early signs of deteriorating eye-health. Can I get a copy of my eye exam results? Yes. The Privacy Act gives you the right to access your personal health information. As a health consumer, you also have the right to be informed about the results of any tests, options for treatment, and the benefits and costs of these options. What should I do if I have problems with new glasses? It's not uncommon for people wearing new glasses to strike problems. Your optometrist may need to make minor adjustments to the findings from your eye exam to reach a prescription that's right for you. This is referred to as your "dispensed prescription". Who has to pay for repairs if glasses are faulty? Glasses are covered by the Consumer Guarantees Act (CGA). Where glasses aren't of acceptable quality, it's the retailer's responsibility to remedy the problem. However, if you're buying glasses from an overseas website, the CGA won't apply: you'll need to carefully check the retailer's trading history and returns policy. Can I use over-the-counter reading glasses? If you only need glasses for reading, ready-made hobby or reading glasses may be an option. But you should get an eye test first to identify any problems. Is the cost of glasses subsidised? With the exception of children's glasses, the purchase of prescription glasses isn't subsidised by the government. If you want to keep costs down, fitting new lenses to second-hand frames can be an option. Your optometrist may also have end-of-the-line-frames they're prepared to sell off cheaply. What training does an optometrist have? Optometrists trained in New Zealand complete a Bachelor of Optometry at the University of Auckland. All optometrists have to be registered by the Optometrists and Dispensing Opticians Board. Only a registered optometrist can prescribe glasses or contact lenses. You can check an optometrist's qualifications and date of registration at www.odob.health.nz. Who deals with complaints about optometrists? Complaints about the care you receive from an optometrist can be made to the Health and Disability Commissioner. If your complaint is about a product or service, you can go to the Disputes Tribunal. This has come a long way in a short space of time - probably, because in my experience they are 75% less than through a physical site. Just had an excellent first up experience - large range which you could 'try on' by uploading a photo to their website, delivery 2 weeks. First pair arrived with incorrect lenses - probably my fault. After using their 'chatline' they were apologetic (?) and will replace free of charge. They suggested I could donate my first pair to charity. 10/10 for service and as I said 75% cheaper than a high street outlet. Maybe worth a Review. I think it's about time Consumer updates these prices and the article, really !! !Going back 5+ years!! Thanks for your feedback - we'll keep this article in mind for an update. In the meantime, you might be interested in the results of our recent (2017) retailer satisfaction survey which included a look at optometrists.